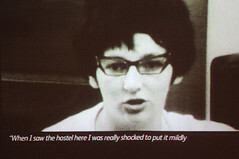 Still from a video shown at the National Museum of Scotland about Scottish emigrants to Australia. I just grabbed a shot - ISO 3200; f2.8; 1/250s. I'm very interested in Scottish emigration from the push and pull reasons for why they left to the experience of the journey to each story of how they got on in their new lands. But what is also fascinating is the heritage and culture they have installed in their new countries. What I can actually photograph is what has been abandoned back home, here in Scotland, from the decayed houses and ghostly silent communities to the heritage remnants.